This post pays tribute to simplicity. A good combination of two colors can create a simple but satisfying piece. Below are a few of my favorite ways to use only two colors in a plain weave design. You'll find the pattern chart below each one. If you use any of these to weave a piece yourself, I'd love to see the results. Send a link or a photo to me at Play@WeaverGuitarStraps.com. Love the green and yellow. I am looking for a pattern for Swedish colors, blue and yellow. This would work, I think. Just learning. Do u just use one color on the shuttle? Robin. The shuttle holds the weft yarn, which doesn't show except a tiny bit where it comes out the end of the row and turns into the next. 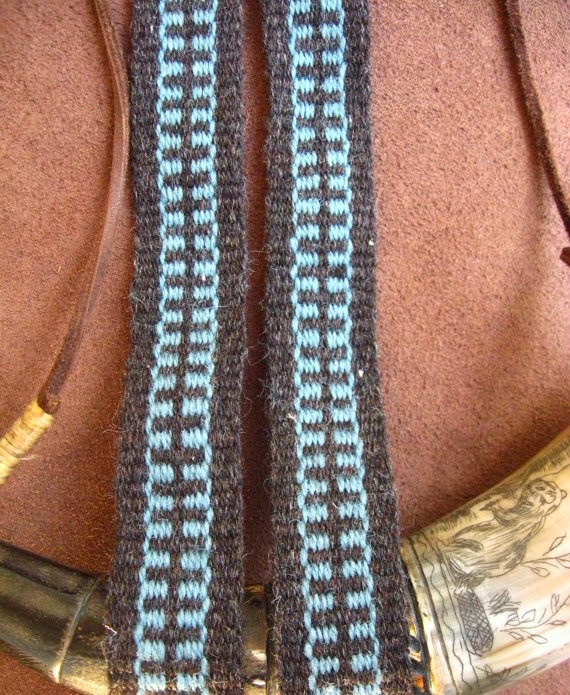 Inkle weaving is warp-faced, no weft showing. 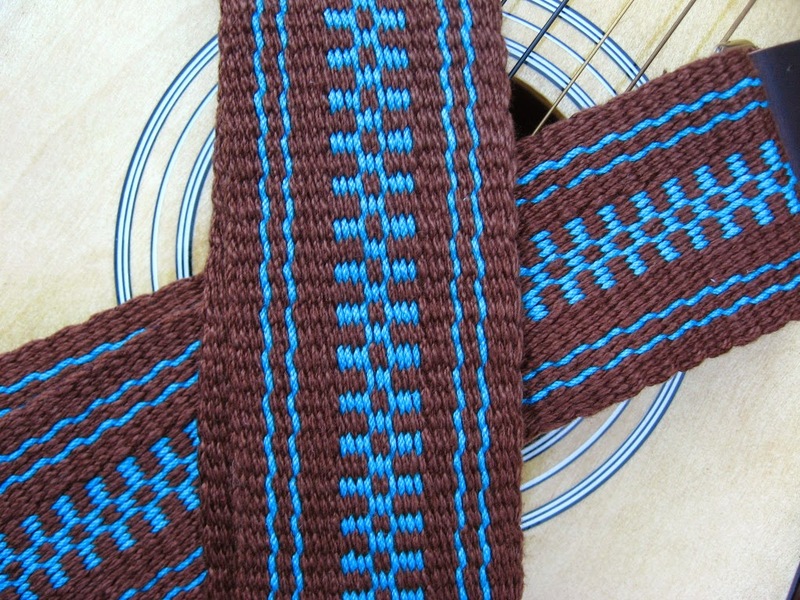 I usually use the same color for weft as I do for the warp in the border areas; this way it is not noticeable at all. 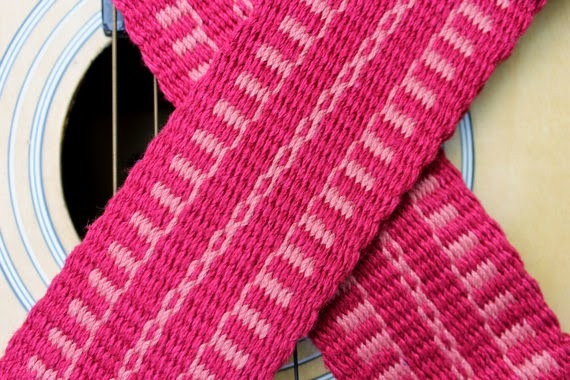 You can use a contrasting color which will then just show a tiny spot of the weft color along the edge. I hope that helps. la urdimbre , es el gráfico? en ese orden debo poner los hilos en la urdimbre? Sí. en este tipo de tejido, sólo la urdimbre puede ser visto. Utilice un solo color para la trama que no se verá. Empuje la urdimbre juntos para que cada toca la siguiente. Espero que entienda usted mis instrucciones. Yo no hablo bien español. I like the green and yellow ... if I make the "green" purple and the "yellow" gold, it should fit for a Vikings football fan, don't you think? Thank you for sharing! Connie, sounds good to me! If you want a book in print, I recommend Helene Bress' Inkle Weaving which you can purchase by following the link in my side bar to the Woolery. I just was gifted with an acoustic guitar from my daughter. It does have a place to attach a strap at the bottom, but I don't see a way to attach the other end on the guitar body or the neck. Can you help me figure out how I would attach a strap? Love to make one, but can't justify the hardware if it won't work for my guitar! Thank you! And I just made the green and yellow with black and gold/yellow. Looks awesome. Just curious. In one of your videos you state that you always heddle your first warp because it is makes things easier to control. In the last pattern with the 2 shades of green however, it shows the first warp as non-heddled. Or am I reading it incorrectly?